John Buckley / St. Finbarr’s A.C. Cork Half Marathon 2011 — St. Finbarr's A.C.
St. Finbarr’s A.C. is pleased to announce that this year’s John Buckley / St. Finbarr’s A.C. Cork Half Marathon will take place on Sunday morning September 11th at 11am. Race H.Q. for this event is the Blarney GAA Grounds off Castle Close Road. This race also incorporates the Cork and Munster Half Marathon Championships and follows the traditional looped course from Blarney to Grenagh and back. There will be no separate registration for the Cork and Munster Half Marathon Championships. Cork AAI members will automatically be entered for both championships, while Munster AAI members will be entered for the Munsters. A large number of entries is expected, so please allow plenty of time for parking, registration and warm-up. To reduce queuing and speed up processing, on-the-day entrants will be required to fill out an entry slip giving Name, Gender, Club, D.O.B, Age Category & Mobile Number details. Just present the completed slip with the €25 entry fee at the desk and you will receive your race number and race chip pre-packed. Post race refreshments and prize giving will take place back at the GAA clubhouse and grounds. Chip timing will be provided by Precision Timing. The chip will allow for timely and accurate collation of results. Runners’ individual finish times will be confirmed by Text on the day of the race. In conjunction with our sponsor John Buckley Sports, highly visible race pacers (1:30, 1:45 and 2:00hrs) will be used for the first time to help participants reach the finish line while maintaining pace, staying safe and most importantly, having fun! The race pacers will be equipped with balloons, brightly coloured tee-shirts and a target time on their backs. All finishers will receive a goody bag with a souvenir and money off voucher from John Buckley Sports. According to Google, the approach road, start road and lead-off road for this race are listed as “Unknown Roads”. I’ll have to check this out and get back to Google Maps. Anyway, to get to the Blarney GAA Grounds, head out of Cork on the N20 (Mallow Road) and exit at the Blarney (R617) slip road at (A). Take the first left turn (Route 1) after the roundabout and follow the Clogheen-Milcon Walkway on your left. There’s a car park for users of the walkway about half way down this road on the right. At the next junction turn right and then left to arrive outside the GAA Grounds at (B). There’s a small lay-by with limited parking facilities between these two junctions adjacent to the START line. There’ll also be limited parking both inside and outside the GAA Grounds on Castle Close Road, and there’s also parking available in the Scoil Mhuire Gan Smál secondary school just off the R617. To arrive at the school, take the second left hand turn (Route 2) beyond the roundabout. The heavily wooded back roads just north of Blarney village provide a leafy backdrop for the Cork Half Marathon. At the outset, we’ll have to concede that ours isn’t exactly the flattest Half Marathon around, but it might just be one of the Greenest. If you’re running the course for the first time, you may indeed be a little disorientated at times. In truth, there’s so much woodland and foliage along the route that it can sometimes be hard to see the wood for the trees. On the other hand, all this natural greenery makes for welcome protection in the event of adverse weather conditions. Anyway, foretold is forewarned as they say. There’ll be four water station locations – one at the FINISH and three on the course. Two of the stations are passed twice along the way giving a total of six water stops. Click on the Route Map above for details. 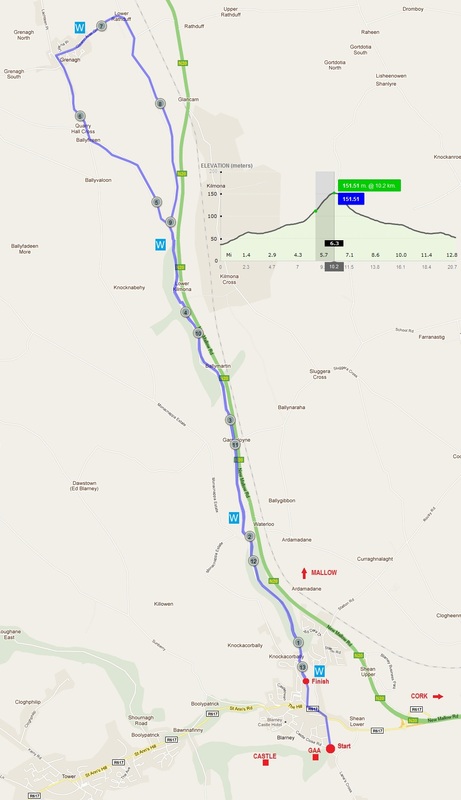 The course itself is like a giant paddle, the handle running northwards from Blarney past Waterloo, Monacnappa Estate and Lower Kilmona. 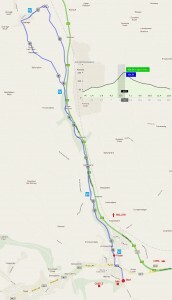 For the most part, the route runs parallel to the N20 Cork-Mallow road, whose traffic can be heard in the distance. At about 4.7M, it loops clockwise around the blade, the tips of which comprise Genagh (6.5M) and Lower Rathduff (7.1M), before heading back down the handle to the FINISH on Waterloo Road. The race starts at a Y-Junction just outside and to the right of the GAA Grounds. You take the right fork up Castle Close Lawn past the secondary school and turn left past the garage with a slight pull up Shamrock Terrace before turning right onto Waterloo Road and the beginning of your hinterland odyssey. You’ll pass the FINISH at around 1km. There’s a relaxing downhill section about 200m further on, the only one between here and Grenagh. For the next mile, you’ll be running through woodland with the river Martin on your right. At the Waterloo Inn (2M), you’ll go over Putland’s (Waterloo) Bridge and on past the church and the round tower on your right. At the 4.6M (7.5km) mark, you’ll have been climbing steadily at 37ft/M (Av. 0.7% gradient). From 4.6M (7.5km) to 6.3M (10.2km), the climb rate increases to 124ft/M (Av. 2.4% gradient). 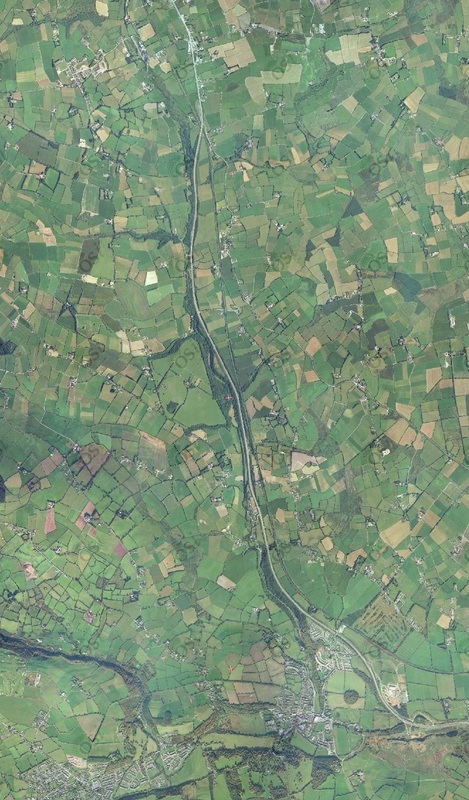 When you reach Grenagh at 151m, you’re at the same elevation as Cork Airport. After a right angle turn through the village, there follows a rapid descent at -140ft/M (Av. 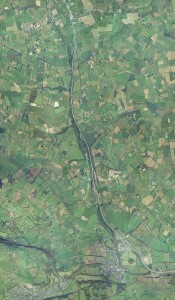 -2.6% gradient) to Lower Rathduff on the opposite edge of the blade. Now you’re really flying! Another right angle turn and for the next 2M you’re heading along more wooded roads albeit at a more sane rate of descent. At the 9M mark you’re back on the main road heading down the handle for home. About 400m out, there’s a 150m uphill section, which gradually levels off leaving you with a 250m dash for the FINISH. Don’t forget to pick up your water bottle and goody bag before heading back to the GAA Grounds. St. Finbarr’s A.C. members have put a lot of time and effort into preparations for the Cork Half Marathon. We greatly appreciate your participation in our race and will do everything possible to ensure that yours is both a pleasant and rewarding experience. Please note that the public roads will remain open to traffic during the race. Therefore, runners must run on the left hand side whilst exercising due care and caution. In the event of an emergency, all stewards will be issued with an emergency contact number. We wish all of you the very best of luck on Sunday and look forward to seeing you back at the GAA Grounds for some refreshments.